On the morning of Tuesday, November 8th I woke up ready to usher in the first female president of the United States. My three years of researching and writing about entrenched and institutionalized racism, sexism, homophobia and xenophobia prepared me for an inevitable Trump victory – and yet my optimism held out. What I both expected and feared proved true that evening: Trump was elected the 45th President of the United States. Moments after that stocks in private prisons surged a staggering 58%. Trump’s victory was a catalyst for investments in the private prison industrial complex, but there is more to the story than The Donald. The business of locking people up for profit, particularly poor men of colour, is as American as apple pie. 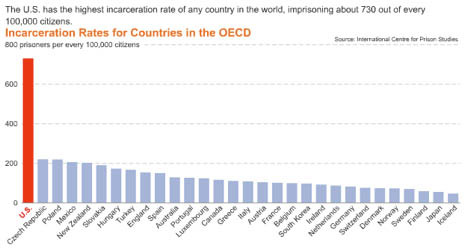 The United States incarcerates more of its racial minorities than any country in the world; in fact “the United States imprisons a larger percentage of its Black population than South Africa did at the height of apartheid” (Alexander, 2012). How did we get here? Perhaps the single biggest misconception is that racial segregation ended with slavery, that the Civil War created a just and equitable society for all Americans regardless of race. While this notion appeals to our collective sense of white guilt it simply isn’t true. The abolition of slavery resulted in former slaves walking away from their plantations; this left the white elites without free labour. In a capitalist country built off slavery and genocide this wave of progress was unacceptable. Being white and elite, the plantation owners had the power to create new legislation and as a result within the year it became illegal to be an unemployed Black man under vagrancy laws enforced by Black Codes that aimed to restrict freed Black people’s movement and agency (Alexander, 2012). Who would employ former slaves when they could continue getting their labour for free? Once unemployed Black men were incarcerated under the new vagrancy laws the prisons began contracting out their labour to the highest bidder. Black men were back on plantations, brickyards and farms – slavery never ended, ownership merely changed hands. The freed Black man was free no more and the prison industrial complex as we know it was born. The profitable prison population began to grow tenfold of any other country in the ensuing decades. Many of us who lived through the 80s and even those of us who didn’t are familiar with Reaganomics and the Welfare Queen Myth of the Reagan administration that propelled the criminalization of Black bodies and poor bodies. Many progressive liberals assume that the growth of prisons, the disproportionate criminalization of Back folks, and the slashing of prisoners’ rights are all direct results of Republican leadership – this too is not true. One of the biggest proponents of the industrial prison complex was Democratic President Bill Clinton. Bill Clinton vowed to be the most ‘tough on crime’ president in American history – and he was. In 1992, then only a presidential candidate, Clinton flew to his home state to personally oversee the execution of a mentally ill Black man in hopes of solidifying his ‘tough on crime’ stance and securing his presidency (Alexander, 2012). After his ascension to the White House, Clinton’s policies resulted in “the largest increases in federal and state prison inmates of any president in American history” (Masci, 1994 in Alexander, 2012) as well as a lifetime ban on social welfare benefits such as financial aid, access to SNAP (food stamps), and subsidized housing (Alexander, 2012). Clinton’s legacy left an extraordinary footprint on the expansion of prisons: the ineligibility of qualifying for the very benefits that ease the transition of former inmates back into the community created an impossible cycle: people are imprisoned for engaging in, most often, the sale of illegal drugs (remember that only 7.9% of the prison population are violent offenders; over 90% of inmates are incarcerated for non-violent, half of those on drug-related offenses) in order to survive in a society that has disenfranchised them from any source of meaningful, gainful employment on the basis of race, gender, class or a combination of all three; they serve their sentence, return to the community only to be faced with the same bleak prospects, now compounded by their exclusion from federal assistance programs, wherein they are left with no possibility of a future outside of incarceration.The system is stacked. So now we’re familiar with the history of prison growth and expansion: primarily with how the prison industry was born out of slavery, how the post-war Republicans capitalized on white America’s fears to continue criminalization of Black bodies and how the Democrats from the 90s onward carried this torch, igniting it further. Where does this leave us today and going forward? In 2015 of the total New Yorkers who were stopped and frisked 83% were people of colour (innocent, no contraband substances/weapons) despite the fact that only 1 in 4 New Yorkers are Black, and at a national level only 12% of the population is Black. Moreover, of all the stop and frisks of people of colour only 0.15% resulted in a concealed weapon (Alexander, 2012). White people are 45% more likely to sell drugs than Black people, yet 90% of those serving drug related charges are Black (Alexander, 2012). Mandatory minimum sentencing laws carry heavy racial disparities: the minimum mandatory for crack cocaine (predominantly Black consumption) carries 18x the sentence of the same amount of powder cocaine (predominantly white consumption) despite the two substances being virtually molecularly identical; moreover powder cocaine is actually 3x (12% vs. 4%) more pervasive than crack cocaine at a national level. In Florida only 5% of all drivers are people of colour; despite 80% of all stops by police involved Black or Latinx drivers. 48 states and Washington, DC prevent inmates from voting; this means that 6 million people (or 1 in 40) cannot vote. Prisons, prison populations and the laws supporting racialized incarceration are rapidly multiplying in unprecedented numbers. If you think this is bad, it gets worse. The effects of prisons and mass incarceration impacts communities far beyond inmates and their immediate families. Prison construction takes place predominantly in white rural areas – while rural white America constitutes only 20% of the population, it houses 60% of the country’s prisons; this is intentional and calculated. Why? Because the Census Bureau considers inmates as residents of the area in which they are imprisoned. What does this mean and why is it important? At a state representation level what this means is that rural white communities end up with more people in state legislature to represent them while the poor, marginalized communities predominantly in urban areas end up with less and less state representatives because it seems as though their community populations are declining. The law which governs this process, the Usual Residence Rule, is a direct continuation of a clause from the original constitution which held that slave owners with the most amount of slaves were responsible for calculating congressional seats and electoral votes – despite the fact that slaves then and inmates and former inmates today cannot vote. 2016 America is not so different from 1790 America. Like the Trump victory, all of this is pretty terrible. But it doesn’t have to stay like this. So what can we do? Many companies exploit prisoners and their labour for as low as 12-40 cents/hour. These companies include Whole Foods, Victoria’s Secret, AT&T, Wal-Mart and McDonalds. Vote with your dollars – stop purchasing with these companies and tell them directly why: write to them, tweet at them, send them a carrier pigeon – make sure these multi-billion dollar industries know that we will not stand for the exploitation of inmates. Donate to ACLU’s National Prison Project; their goals are to “promote a fair and effective criminal justice system in which incarceration is used only as a last resort, and its purpose is to prepare prisoners for release”. Write to a prisoner. Many inmates don’t have families or connections outside of prison and those that do are often incarcerated hours away from their hometowns, sometimes even out of state. Not only do you get to foster a supportive friendship, but pen-pal projects have been linked to lowered rates of recidivism. Visit http://www.writeaprisoner.com/ for more information. Educate yourself about solitary confinement and find the way best suited for you to get involved in solitary confinement abolition. Full resources are available here. The state of the prison industrial complex is abysmal but it doesn’t need to be like this; small groups of people have made significant changes throughout history. Prison reform and abolition are not out of reach – we can be part of that change.